Meet Our Team Of Compassionate Creatives! ​Jackie is very excited to join the Art Indeed team. She is a Registered Psychotherapist and Art Therapist. She studied at the University of Windsor graduating with a degree in Visual Arts and Psychology and then graduated from Wayne State University with a Master’s degree in Counseling and Art Therapy. Jackie has experienced the benefits of the healing arts first hand as art was what helped her work through personal losses and provided a safe space to build up her own inner strength and resiliency. She feels so grateful to be able to share the expressive arts process with children and teens – to enter into a creative space with them fostering their self-esteem and providing a nonjudgmental, safe space to discover something new about themselves. She believes in building on people’s strengths and thinks that art has a unique way of building up the whole person, not just a single issue or problem. Jackie has years of experience working in hospice with grief, loss, depression, and anxiety. When she has free time she loves spending it with her husband and daughter, reading and working with mixed media. Marcie is an artist, elementary teacher and yoga instructor. Marcie is honoured to have facilitated numerous expressive art programs for Art InDeed over the years (2008-2013) including programs with children, teens and adults with special needs. She is eager to rejoin the amazing Art InDeed team this year. She loves seeing and encouraging participants to explore and learn through play and the creative process. Marcie studied Visual Arts and Psychology from the University of Windsor, before obtaining a diploma in Early Childhood Education and a Bachelor of Education degree. She is currently a full-time teacher at a French Immersion school and enjoys bringing arts to life in the classroom. Marcie is a certified yoga instructor (200 hour) and a Reiki Practitioner. She believes in combining yoga and mindfulness practices with the arts to support a holistic approach to self healing and personal discovery. A recent graduate from the University of Windsor with a degree in Visual Arts, Olivia believes through the act of creating, using a variety of mediums, we are able to further explore our inner selves and experience arts' healing powers. She enjoys being a part of a community and is inspired to share and accompany others in the transformative discovery of creating art. Olivia is so grateful and happy to be a part of the Art Indeed team! Currently, Olivia is facilitating programs at Hospice, Alzheimer's Society, Extendicare, and Christian Horizons. In her spare time, Olivia enjoys drawing, painting, hiking, reading, and travelling. Corinne is very excited to be on the team at Art Indeed! She is honored to assist in various programs offered and to work in the studio. Her passion and love for the arts is what inspired her to join the Art Indeed team, and further pursue her education in the arts. Corinne has experience teaching independent art lessons, has facilitated many solo and collaborative art exhibitions and has worked and volunteered for numerous art businesses in the community. "I am honoured to join this warm hearted dynamic team!" And, we are excited she is with us! Nicole hopes to bring her unique touch of playfulness and creativity to the collective soup of the Art Indeed team! Nicole has always had a penchant for writing since she was a small child. She was shy and with some help from the right people was able to find the best ways to express herself. This snowballed to performance arts, photography, film and crafting. Nicole graduated from the U of W with a BA in general arts with a focus on communications. She is also a current practicing Reiki Energy Practitioner. She holds firm beliefs in and a passion for mindfulness practices and Inner child work for every stage of a person’s life. Her core passions stem from a genuine love of human connection and seeing everyone flourish. In Nicole's words she says: "Art and the act of creating is the best vehicle for many of us to come to so many beautiful conclusions about ourselves and the world we live in. I am not a stranger to hard times and healing in my own journey and I hope to connect through my lived and overcome experiences with every person put on my path. I want to leave every place I go better and with a smile." Nico was born in West Windsor, Ontario. He ventured out on his own - the curious cat he is - and ended up at one of the residences on Maryvale's campus where Art InDeed's founder, Danah Beaulieu, was working. He was bound for a life of creativity and colour. It was adoration at first sight when Danah first met Nico! At five months old, Nico was friendly and funny. He was a skinny little kitten with a very big, puffy tail! He greeted each newcomer to the residence in his curious manner! Nico moved into Danah's art studio very soon after they met! 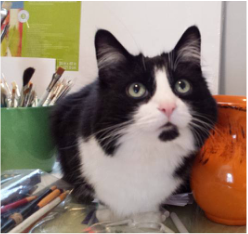 Nico has his four favorite pastimes: sitting in the art studio window watching the world go by, rolling around and stretching, getting into the chalk pastels (his favorite colors are green and blue), and visiting the art classes and participants in the studio. He especially loves the all girls and ladies classes. He likes to show off his tail and loves the sounds of pencil on paper. He will attack your pencil when you're drawing, so make sure you are "staying loose" . If he wore a hat, Nico would wear a burgundy-coloured fedora with a big, blue feather in it. He is discriminating in his fashion taste - he prefers to wear a tuxedo everyday! He is intelligent and playful, he has a gentle personality but also is naughty and curious. He goes crazy for bling and sparkling things. He likes to perform his "attack and roll" routine if sparkles are in view! We have found him full of sparkles on numerous occasions, especially after Girl's Group is finished. His love for sparkle reflects Nico's entrepreneurial spirit, and his attack and "roll with it" business acumen, it allows him great insight! He signs off on all of our big accounts, approves our community partnerships, and makes final hiring decisions. He is the Big Boss at Art InDeed. ~ He can't wait to meet you! !